Venice gallery-guides.com - Venice, Italy art galleries guide Venice Peggy Guggenheim Collection information about collection of 20th-century art, paintings by Picasso, Kandinsky, Pollock, location and address, and general information about Peggy Guggenheim Art Gallery in Venice (Venezia) area, Italy (Italia) IT - Last updated 30/10/2012. This delightful gallery may be small, but it is home to a large and impressive collection of 20th-century art, paintings and sculptures. 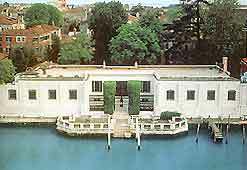 The Peggy Guggenheim Collection is housed in the stylish and luxurious apartments in the Palazzo Venier dei Leonii, which was once home to the wealthy heiress, Peggy Guggenheim, who died in 1979 aged 81. A serious collector and patron of art, highlights at the Peggy Guggenheim Collection art gallery include works by Picasso, Kandinsky, Pollock, Motherwell, and her former husband, Ernst. The building was originally planned to be a grand four-storey palace, but it was never completed and the art gallery only has one floor.